Conan O'Brien announced this morning, via his Twitter page, that he is taking his comedy on the road. For the past few weeks there have been rumors circulating that he would be doing just that, but there had been no confirmations until about an hour ago when he Tweeted: Hey Internet: I'm headed to your town on a half-assed comedy & music tour. 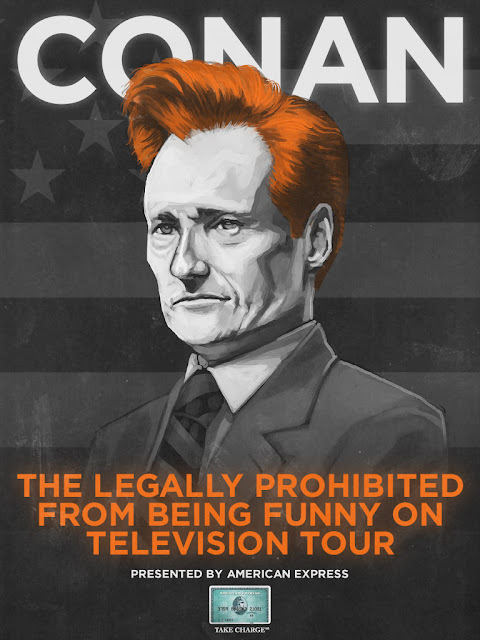 Go to http://TeamCoco.com for tix. I repeat: It's half-assed. The website crashed almost immediately because of the deluge of traffic, so he issued a follow-up Tweet letting fans know they can also get tickets from Ticketmaster. Check out the website and see if he'll be coming to an arena near you. Expect a night of "music, comedy, hugging and the occasional awkward silence."